Relocating from one house to another or from one place to other is not a new phenomenon, as the world has become more flexible and dynamic. Either you relocate yourself because of some job commitments or looking for another lucrative opportunity. Whatever the reason might be, if you analyze the total spectrum, the whole task of relocating would appear more chaotic and stress-full. However, there is a silver lining amidst all this chaos and stress and that is proper planning before you move things from source to the destination, i.e., first you have to work on the plans and then you should execute them. Clearly, the basic behind this is that your things should reach your place of choice undamaged and intact. First and foremost moving tip is that you should make a list of items, which you think would be required at your new place. This is particularly very important as most of us forget things, in spite of remembering it numerous times. Likewise, either sell the things that you are not going to require or just throw them away. Again, you should make sure whether you are done with filling address change forms, school transfer documents, transferring prescription and different other utility start-ups. You should also call the relocating company and get your reservations done a month in advance, as you do not want them to be booked on the day when you need to shift. Give them the list of your total luggage and accordingly ask for the moving vehicle. However, if you are moving to another country, then be sure that the moving company takes responsibility of your expensive belongings. Apart from that, start packing your things early as you cannot predict how long the whole process is going to take. Definitely, you do not want to run here and there looking for packing materials and boxes, rather you would like to spend the last few minutes or so in acquiesce. You should also take care of the things that you would require, as soon as you get in your new house or new place. You should not forget to inform everyone starting from your family, friends to your near and dear ones that you are relocating. Giving them the address and phone number of your new place is the task that you should never miss out. There is another issue, which you should be aware of prior to the relocation, is the weather report of your moving day. Obviously, you do not want to reach your new place in snow storm or heavy drizzle, while you have packed your coat somewhere else. You would also require additional moving time, in case the weather interrupts the traffic. When it comes to important documents, you should remember to collect all the receipts, as they might help you in getting some rebate out of your tax liabilities provided you are moving for employment reasons. 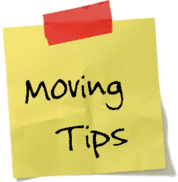 Although relocation and moving is a very tedious job and only a few are able to get through it properly, if you follow the above tips properly you would be able to achieve the same with minimum hassle.